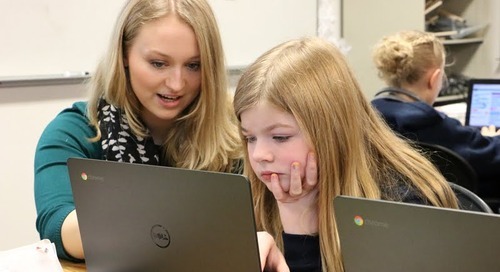 Battle Ground Public Schools is pleased to announce that Instructional Coach Meredith Gannon has won the prestigious Presidential Award for Excellence in Mathematics and Science Teaching (PAEMST). The award, which is administered by the National Science Foundation , is the highest national honor that a teacher can receive. Gannon will receive a $10,000 award and a commemorative Presidential certificate at a recognition ceremony in Washington, D.C. While there, she'll have the opportunity to meet with fellow STEM (Science, Technology, Engineering and Math) educators, researchers and policy leaders. Gannon is an instructional coach at Tukes Valley Primary, where she helps teachers to incorporate the most effective teaching methods into their instructional practices. Prior to her work at Tukes Valley, Gannon was as an instructional coach at Glenwood Heights Primary School and Maple Grove K–8 School. She also spent 10 years teaching at Sacajawea Elementary School for Vancouver Public Schools, which is where she worked when she was nominated for the Presidential Award. As a third generation teacher, Gannon said that teaching is part of her DNA. After completing an undergraduate degree in political science, Gannon worked in the private sector for several years, logging tens of thousands of air travel miles every year. But she found the experience of constant travel and sitting at a desk unfulfilling, she said, and knew immediately that teaching would be her next career move. In the classroom, Gannon prefers leading students in hands-on projects versus using traditional teaching methods. She often pulls the outdoors into her lessons, for example taking advantage of a local stream where students test water quality, examine macroinvertebrates, and observe environmental changes. “Using outdoor learning, I strive to help students make strong personal connections with the natural world and empower them to use their knowledge and skills to make positive contributions to our society,” Gannon said. Her students have presented their findings at Watershed Congress, a City of Vancouver event that focuses on education, discovery and stewardship. Gannon also has coordinated Salmon in the Classroom programs and field work opportunities. While working as a teacher at Sacajawea Elementary, she coordinated the implementation of a solar panel array through her Solar 4R Schools Grant. Gannon’s passion for teaching is contagious. In fact, her husband decided to follow in her footsteps, abandoning his previous career in favor of becoming a fourth grade teacher. Gannon has a B.S. in political science from Santa Clara University and a master’s degree in teaching in elementary education from Washington State University Vancouver. She is a National Board Certified Middle Childhood Generalist. To date, Gannon’s other awards include the Amgen Award for Science Teaching Excellence and two local Teacher of the Year awards. As Sacajawea Elementary’s Green Team advisor, she received the Department of Education Green Ribbon School Award and five Washington Green School Awards. She has also worked as an author of Washington’s learning standards for Environmental and Sustainability Education.